Over the past few years, the hybrid has been climbing closer to the top of the interests lists of car buyers everywhere; however, at our Jackson MS area Honda dealership, we understand that in today’s world, hybridity is becoming more popular by the day. This year, Honda has surpassed other brands while considering the concept of the hybrid. The 2015 Accord Hybrid is different from its predecessor as the driver can shift between three distinct drive modes. The 2015 Hybrid model’s exterior is similar to that of the Accord Sedan, but it also has a number of individualistic features that are hybrid-only design elements like the blue accent front grill, headlights, and its aerodynamic advantage. For instance, the Accord Hybrid exploits efficiency and style with an assortment of aerodynamic details like the decklid spoiler. The three distinct drive modes for the 2015 Honda Accord Hybrid consist of: EV Drive, Hybrid Drive, and Engine Drive. EV Drive is entirely 100% electric and is usually used during breaking and when the car starts from a complete stop. Hybrid Drive uses the fuel engine and electric motor—the best of both worlds—to provide and extra energy while accelerating. Once your Accord Hybrid is cruising with highway efficiency, Engine Drive takes control. 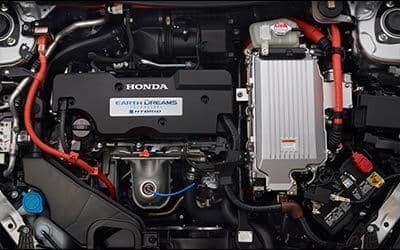 Even the Earth Dreams Technology™ Engine is unique to the hybrid model which is why it feels more like a regular Accord than an electric hybrid. The 2.0L, 16-valve i-VTEC® 4-cylinder engine and the electric motor fed by a lithium ion battery pack produces a smooth drive and comfortable feel. The process results in a driving experience like never before with the perfect amalgamation of efficiency and performance like no other vehicle in its class. Every Accord Hybrid features different safety features than that of the Accord Sedan; although, the standard rearview camera, designed to assist the driver while in reverse, is a standard for Accords across the board. Every Hybrid model features lustrous Daytime Running Lights that both look eccentric with their LED bulbs, but also, the DRL lights also make the vehicle more visible to other drivers. HondaLink™, an available feature that all Jackson MS Honda fans can enjoy, allows the driver to access music, social media, and other personal content while behind the wheel without ever having to reach for your phone. The system also permits access to various cloud-based services, while interacting directly with the vehicle’s control panel. The 2015 Accord Hybrid offers an array of options and features available to its drivers. Honda LaneWatch™, Lane Departure Warning, Steering Wheel-Mounted Controls, Bluetooth® HandsFreeLink®, and Adaptive Cruise Control are only a few options that Jackson MS Honda fans can indulge in. The Honda Accord Hybrid is available in Hybrid, Hybrid EX-L, and Hybrid Touring trim levels. Visit us a Patty Peck Honda, our Jackson MS area Honda dealer, to test drive your own Hybrid model today. Contact us at (601) 957-3400.